This data product was developed for the High Resolution Model Intercomparison Project (HighResMIP v1.0) of the Coupled Model Intercomparison Project 6 (CMIP6). The monthly mean LAI data are provided in one NetCDF (.nc4) format file. Figure 1. Mean LAI (m2/m2) for July for the period 1982-2015. 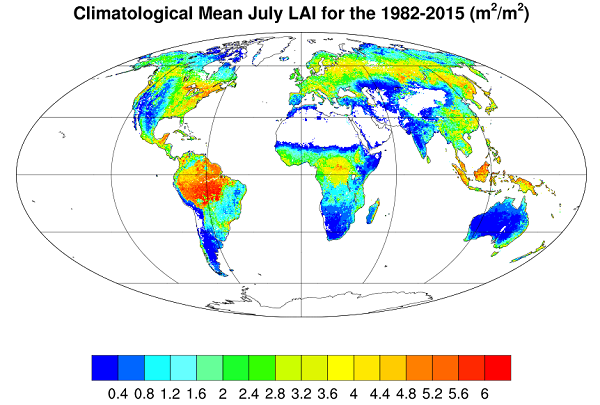 This dataset provides a global 0.25 x 0.25-degree gridded monthly mean leaf area index (LAI) climatology as averaged over the period August 1981 to August 2015. The data were derived from the Advanced Very High Resolution Radiometer (AVHRR) Global Inventory Modeling and Mapping Studies (GIMMS) LAI3g version 2, a bi-weekly data product from 1981-2015 (GIMMS-LAI3g version 2). The LAI3g version 2 (raw) data were first regridded from 1/12 x 1/12 degree to 0.25 x 0.25 degree resolution, then processed to remove missing and unreasonable values, scaled to obtain LAI values, and the bi-weekly LAI values were averaged for every month. Finally, the monthly long-term mean LAI (from 1981-2015) was calculated based on the data availability. For example, the climatology for January was calculated as the average monthly value from 1982 to 2015, but the climatology for August was computed as the average monthly value from 1981 to 2015. The data product was specially developed for the High Resolution Model Intercomparison Project (HighResMIP v1.0) of the Coupled Model Intercomparison Project 6 (CMIP6) (Haarsma et al., 2016). Temporal Resolution: Monthly means averaged over the period 1981-08-01 to 2015-08-03. There is one data file in NetCDF format (.nc4) with this dataset: LAI_mean_monthly_1981-2015.nc4. The file provides the monthly mean LAI climatology at 0.25 x 0.25-degree resolution averaged over the period 1981-08-01 to 2015-08-03. Long-term global data sets of vegetation Leaf Area Index (LAI) are critical to monitoring global vegetation dynamics and for modeling exchanges of energy, mass and momentum between the land surface and planetary boundary layer. LAI is also a state variable in hydrological, ecological, biogeochemical and crop-yield models (Zhu et al., 2013). A quality assessment was not provided for this product. See Zhu et al., (2013) for discussion of the validation of the AVHRR GIMMS LAI3g product. These mean monthly LAI data were derived from the AVHRR GIMMS LAI3g version 2 bi-weekly data product (1981/08 to 2015/09). The development of the AVHRR GIMMS LAI3g product is described in Mao et al. (2013) and Zhu et al. (2013). For the generation of the monthly mean LAI climatology provided in this dataset, the AVHRR GIMMS LAI3g version 2 bi-weekly (raw) data product was processed to identify missing values and unreasonable values higher than 7000 and to replace them with 0, and a scaling factor of 0.001 was applied to obtain the actual LAI. Then the raw 1/12 x 1/12 degree LAI3g data were regridded to 0.25 x 0.25 degree using the bilinear interpolation. Since the raw LAI3g data provide bi-weekly LAI, i.e., two LAI values for a certain grid every month, monthly mean LAI for the new product was calculated as the average of the two values for the remapped data. Finally, the 34-year or 35-year mean monthly LAI was then calculated for each month based on the data availability. For example, the climatology for January was calculated as the average of 1982 to 2015, but the climatology for August was computed as the average of 1981 to 2015.